When we think of orthodontics, the first thought that comes to mind is teenagers with a mouth full of metal hardware. At that age, it seems more acceptable since parents want to provide their kids a healthier and more attractive smile if they can. Unfortunately, the appearance of braces doesn’t seem to translate well as an adult. 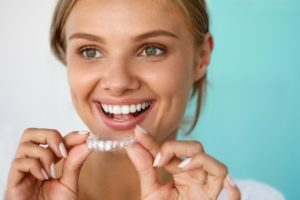 If you’re an adult trying to straighten teeth, but would rather do so more discreetly, Invisalign in North Naples may be right for you! One of the most common reasons adults choose Invisalign over traditional braces is for their appearance. Invisalign uses clear aligner technology that works to shift teeth over several months. The aligners apply gentle force to shift teeth like braces do, but without brackets, elastics or arch wires. Alternatively, a series of aligners is created and your alignment treatment is mapped entirely from the start. Instead of hiding a metal mouth, you can smile with confidence knowing that your family, friends and coworkers are none the wiser. Furthermore, clear aligners are removable, unlike traditional braces. If you want to ensure your aligners are not visible whatsoever, you can always remove them momentarily for a photo-op. However, as long as you don’t stain or scratch them, you likely won’t need to! Aligners are made to be removable because of the process used to conduct the realignment. Of course, the perks of being able to remove your orthodontic device are not limited to appearance. A removable device means you don’t need to make adjustments to your diet in order to accommodate orthodontics. Traditional braces require that you make modifications to your diet due to the many crevices food can get stuck in. This can result in a higher risk of tooth decay and dental emergencies should the hardware break or become removed while eating certain foods. Additionally, a removable device means you don’t need to change your at-home oral care routine nearly as significantly as you would with fixed braces. This extra learning and time is necessary with braces to prevent decay and gum disease before they come off, while clear aligners simply require rinsing and sanitizing to prevent plaque buildup and staining. While the treatment time can vary for each patient, the process itself is actually quite straightforward. Simply wear the aligners for at least 20 to 22 hours a day, making sure to only remove them for eating, drinking fluids other than plain water and practicing at-home oral care. After wearing a pair for a set period of time as determined by the dentist, move on to the next pair until you’ve completed the entire series. You’ll also need to visit the dentist every four to six weeks to ensure that your treatment is going as planned. Straightening teeth has never been easier thanks to Invisalign. Schedule an appointment with a cosmetic dentist in North Naples today to start your treatment! Dr. Mark Makram earned his dental degree from the University of New York Buffalo School of Dental Medicine. He’s a certified Invisalign dentist and works hard to make sure you achieve a beautiful and healthier smile. To learn more about his practice, you can contact him through his website.